It is important to know about the sensitivity and the specificity of the serological and the virus antigen tests. In order to determine the sensitivity and specificity of a test, additional groups of animals are checked in a second test, a standard comparison test (gold standard), which reliably classifies the animals as infected or non-infected or as seropositive or seronegative. These comparison tests are generally more complicated than those commonly used in routine diagnostics. The sensitivity of a test (e.g. an ELISA) identifies the percentage of the positive animals recognized as positive in the comparison test (e.g. virus isolation or immunoblot). Infected or seropositive animals with a negative test result are judged to be false negative. The specificity is the percentage of the animals that give a positive result in the test despite being uninfected or free of antibody, respectively. Hence these animals are “false positive”. Laboratory diagnostic procedures should not be done without prior detailed clinical-epidemiological investigations as otherwise the lab results will be too undetermined. It is important to always include the entire herd and also to bear in mind that the unborn animals play a significant role with regard to the chain of infection. In other words, it pays off to plan for the long term – i.e. to include the age structure and the pregnant animals in all considerations. Until recently, Mucosal Disease was diagnosed in a two-step procedure. In a first step the blood of the sick animal as well as that of some healthy control animals was tested for antibodies against BVD virus. If the sick animal turns out to be serologically negative and the others positive, the sick animal, as a rule, has Mucosal Disease. This diagnosis was subsequently confirmed by virus isolation in cell cultures. These days there are a number of ELISA tests for the antibody as well as the virus antigen that ensure a reliable diagnosis. If Mucosal Disease is suspected we recommend an ELISA antigen test. 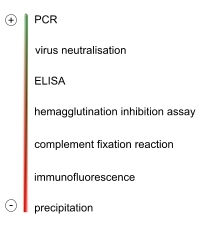 Note: Blood sample for the antibody test (= antibody-ELISA): native blood; for the virus test (= antigen-ELISA): EDTA blood. In principle, the antigen-ELISA test is used: Young animals (up to about 3-4 months) may still have maternal antibodies, which will affect the antigen test. In selected cases of this category the result can be confirmed by means of RT-PCR (production of a cDNA from viral RNA and subsequent PCR). It is also possible to test for virus antigen in the skin. When abortions become a frequent problem (and only after prior contact with the lab) entire foetuses can be investigated. The presence of virus is confirmed by immune fluorescence or by virus isolation in cell cultures. There is little sense in examining a pregnant animal for antiviral antibodies, as it can be both positive and negative, preventing conclusions to be drawn either one way or the other. Serologically negative animals can either be persistently infected or BVDV-free. In Switzerland, around 80% of adult animals are serologically positive. Diagnosis in these cases is rather complicated as a number of pathogens are involved. In addition, non-microbiological aspects, such as feeding and management practices, have to be taken into consideration. It is our view that management conditions should be optimized before contacting the lab. In principle, virus isolations (or direct virus antigen tests in cells taken from nasal mucus) can be done. There is also the possibility to test for significant rises in titre of antibodies against different viruses. Note: in the majority of cases, such investigations promise more than they actually deliver.